SDC Project Team Takes 1st Place Prize in CSIDC 2005 Competition! 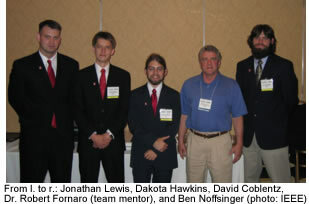 Congratulations to multi-disciplinary Senior Design Center project team members David Coblentz (CSC), Dakota Hawkins (CSC), Jonathan Lewis (CSC), and Ben Noffsinger (Fisheries & Wildlife), for taking the $20,000 top prize in the CSIDC 2005 World Finals held in Washington, DC June 25-28. In taking top honors, this team is the first from the United States to ever win this prestigious competition. Their project entitled NEAT: Networks for Endangered Animal Tracking, combines GPS technology with wireless sensor networks to track animal movements in the wild. This is the second time in the past 3 years that one of our project teams competing in the IEEE Computer Society International Design Competition (CSIDC) has been selected as one of the top ten in the world, and this team benefited from the lessons learned from previous competitors. The team and the SDC staff spent countless hours preparing for the event. Special thanks goes to ePartner and Centennial Campus neighbor, Integrated Industrial Information, Inc. (I-Cubed), for hosting a special preparation "dry-run" event on June 17th. Dr. Bob Fornaro, Director of Senior Design Center, credited their past experience in the competition and the feedback received during the I-cubed practice session with providing them a competitive edge in Washington. Congratulations to the team and thanks to all who helped support them. Thanks to SAS Institute for renewing its commitment as a Super ePartner for the coming academic year with an unrestricted gift of $25,000. Dr. Robert Funderlic & Co-PI Dr. Moody Chu of Math Department have received supplemental funding from the National Science Foundation for their research project titled "The Centroid Decomposition & Approximations to the Singular Value Decomposition" valued at $12,000. Thanks to alumna and SAB Member, Kathy Markham and her husband, Bruce for pledging $5,000 to the Diversity in Computer Science Endowment Fund. Pledges for this new endowment have now topped $70,000. The fund will provide programmatic support for programs and scholarships targeted at attracting and retaining females and minorities in the computer science discipline. Read more about Markham in a new Alumni Achiever feature article. William G. (Bill) Scott Jr., Director of Information Technology and Engineering Computer Services, is retiring on Thursday, June 30, after 17 years of service to the university. Scott began his career as a laboratory supervisor in the Department of Computer Science, and later became assistant department head. With contractors working at a feverish pace, our new building on Centennial Campus is nearing completion. All available resources are now focused on ensuring that classrooms and critical teaching labs are ready for the start of the fall semester on August 17th. To accommodate this push, faculty and staff moves have now been extended into September. 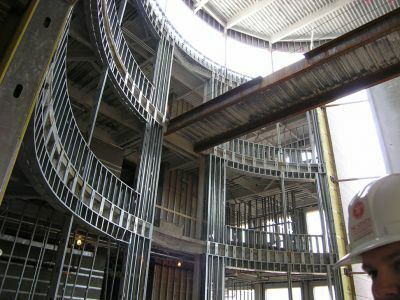 You are invited to follow our construction and move progress by visiting the CSC - New Building Photo Gallery. 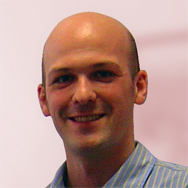 Dr. Jon Mauney, former CSC faculty, colleague and friend to many in the department died on June 10th 2005. He was 50 years old. Mauney attended the University of North Carolina at Chapel Hill on a Morehead Scholarship and was awarded a BS in Mathematics in 1977. He received a Ph.D. in Computer Science from the University of Wisconsin - Madison in 1983, then served as a professor of Computer Science at NC State University, and continued in Raleigh as a software consultant and engineer. He was a connoisseur of food, music, and theatre, a superb cook, and had a great love of nature with a special appreciation for subtle beauty. He was active in the Raleigh Little Theatre and the Triangle Electric Auto Association, and also enjoyed wood turning and gardening. Surviving are his wife Katherine Fox Mauney; his parents, Jack and Betsy Mauney of Tempe, AZ; his brother, Thad Mauney of Billings, MT; his sister, Nina Farjadi and her husband, Jim of Thousand Oaks, CA. We are pleased to welcome Susan Peaslee as our new Accounting Clerk. Until we move to our new building on Centennial Campus, Susan's office will be located in 226 Withers Hall. Dr. Annie Antón has been invited and officially accepted to serve as a member of the International Board of Referees for Computer & Security. Congratulations to Dr. Cliff Wang, adjunct professor and program director for the Army Research Office's information assurance program, who has been selected to attend the 2005 US Frontiers of Engineering Symposium organized by National Academy of Engineering (NAE). His selection is an honor recognizing his leading-edge engineering research.